Let’s face it. There are only so many bike lanes in our region and there remains many places where cyclists are faced with a grim choice. They either must ride in a pebble-strewn parking lane/gutter where they have to avoid obstacles such as parked cars and garbage cans. Or they must ride in traffic lanes with vehicles that are faster than bikes and outweigh bikes by thousands of pounds. With that in mind, here’s a news release Metro issued today on its new bike safety campaign which is more blunt than the “share the road” signs seen on many area streets. The point is this: cyclists are legally entitled to share most surface streets in California. And motorists are legally bound to pass them at a safe distance, although California law doesn’t specify an exact distance. Public officials also held a photo-op Monday to help spread the word. If you’re a motorist and don’t like it, I have this gentle suggestion: perhaps you can join cyclists in calling for more bike infrastructure to be built that helps separate cyclists from vehicular traffic. The Los Angeles County Metropolitan Transportation Authority (Metro) is launching a bold new campaign to increase bicycle safety in Los Angeles County. The campaign, called “Every Lane is a Bike Lane … Bicyclists may need a full lane; Please share the road” will include messages on the back of 75 Metro buses, 135 billboards and spots on 21 local radio stations throughout the region. The campaign will run between March and May, leading up to Bike Week L.A. May 13-17. With bicycling increasing in popularity as a viable transportation mode, more biking events like CicLAvia and more new bikeways being installed on a regular basis, Metro’s extensive campaign will help raise motorist awareness that cyclists have equal rights and responsibilities to the road per the California Vehicle Code. 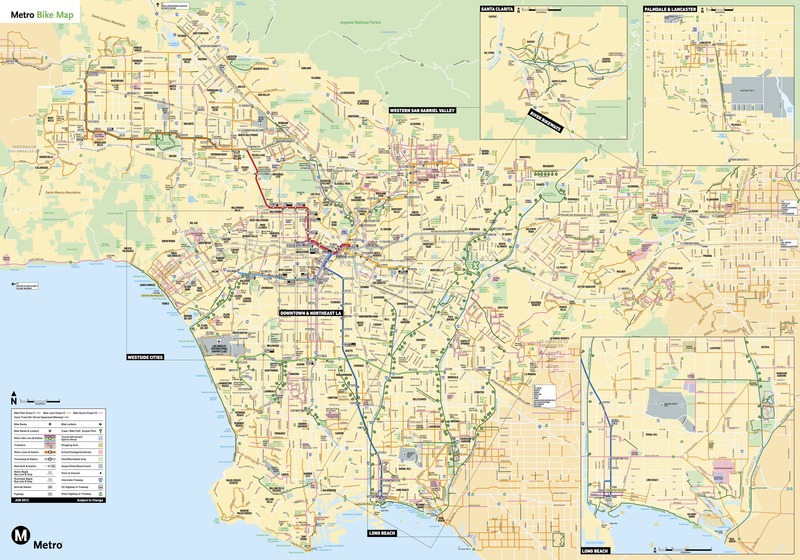 Click above to link to Metro’s bike map for L.A. County. Green lines are bike lanes completely separated from roads, yellow lines show roads with bike lanes and pink are roads designated as bike routes — i.e. places where cyclists must share the road with vehicles. It is becoming increasingly important for motorists and cyclists to safely co-exist on the region’s roadways. In L.A. County, 19 percent of all trips are made by walking and biking, but bicyclists and pedestrians make up 39 percent of roadway fatalities. In the Southern California region, nearly four percent of all traffic-related fatalities involved cyclists, and 4.3 percent of all traffic-related injuries involved cyclists. As part of its overall bicycle safety campaign, Metro also plans to begin traffic skills courses for bicyclists to help ensure cyclists know their responsibilities for riding safely on local streets. Cyclists interested in participating in these future classes should e-mail Metro’s Bicycle Program at bikeinfo@metro.net. Additionally, Metro is planning to sponsor 20 bike rides to further promote safe cycling in Los Angeles County. This bicycle safety campaign is made possible by Metro’s Bicycle Program, which has worked closely with the bicycle community on numerous initiatives related to bicycling and transit. Since 1993, Metro has funded more than $100 million in bicycle improvement projects in the county. For more information about Metro’s Bicycle Program, please visit metro.net/bikes. A big “Thank you” to Metro for initiating this campaign. I hope that in the near future Sepulveda Blvd from Skirball to Santa Monica Blvd can receive some much-needed attention to make the only bike route between the Valley and Westside safer. Actually, thanks to Jerry Brown’s veto, this is still perfectly legal in the State of California. Existing law requires drivers to pass other vehicles and bicycles at a “safe distance” but doesn’t specify what that distance is. If drivers don’t know what constitutes a safe passing distance, how can people who ride bikes or want to ride feel confident that drivers know how to share the road safely? I don’t think “inches” is necessarily what the law intends to be safe — ultimately it seems to be up to law enforcement to decide what is safe and not. Brown said that he vetoed the bill because it could have allowed motorists to cross the center line on a road in order to provide the safe distance. The bottom line: cyclists are legally entitled to share most roads with motor vehicles in California. They can use the center of a lane when moving at the same speed as car traffic. Vehicles have a legal obligation to allow cyclists to use a lane and must pass them safely, although there is currently no specific distance deemed as safe. Got it? Actually, per CVC Section 21202(a)(3), they can use the center of a lane any time it’s too narrow to share with a motor vehicle, regardless of how fast they’re moving in relation to car traffic. Frankly, it’s ridiculous that the DMV’s official, published guidelines contain this inaccuracy. You seem to be missing the gestalt of the intended three-foot law. True, existing law does not specify what a safe distance is, but it puts the onus on the automobile driver to determine what that distance is. This puts the cyclist at a distinct disadvantage, and leaves the determination of fault in the case of a collision up to interpretation. Prima facie evidence, if a collision occurs while an automobile is passing a cyclist, would indicate that the driver of the car did not allow a safe distance for passing, but in this case it’s too late for the cyclist. The three-foot law, if enacted, will cause drivers to think twice before trying to squeeze by, relying only on their own determination of what a safe distance is. Even if they pass the cyclist with one or two feet instead of the required three, having the additional bit of information in their mind that three feet is required by law, would most likely cause the driver to consider the pass more carefully, and might cause the driver to delay the pass until it can be done more safely. Also, you seem to miss the point about the proposed law allowing drivers to cross the centerline during a pass. Drivers do this all the time — to pass other cars, farm vehicles, debris in the road, and in many other situations. I think you were alluding to allowing cars to cross a double-yellow centerline. If this is what the governor objected to, he’s also missing the point — cars do this all the time. If there’s slow traffic, a vehicle stopped on the roadside or for many other reasons, drivers will carefully assess the situation, then go around the obstruction or slower traffic when appropriate, crossing the double-yellow line when it’s safe to do so. The three-foot law would expect the same care applied to passing a cyclist. And given the narrow lane required to give three feet of clearance to a cyclist, the full visibility available to the driver, and the typical speed differential between the car and the cyclist, completing the pass by crossing the double-yellow line is a safe maneuver if done deliberately. Now, why did you end your explanation with “Got it?” I’ll resist returning the favor, because it sounds more than a bit patronizing. Perhaps I’m reading it wrong. I didn’t intend the “got it?” to be patronizing — rather I was trying to be sarcastic as I personally believe current state law gives too much leeway to motorists to determine what’s safe or not. I formed this opinion as someone who frequently bikes around the western San Gabriel Valley. As for the three-foot law, I was just trying to inform readers of what happened with the bill. I wasn’t endorsing the view of bill proponents or opponents. Thanks for that. I see your point of view. I wish more people, especially those who proffer and pass laws, understood your point of view, and mine, better. Bravo to Metro and LACBC for bold action! You’re setting a great example statewide! There’s no point in this if it isn’t enforced. How likely is a cop going to write a ticket to a car driver for this? And what about bicyclists sharing the road with motorcycles? The other day I was bicycling and a motorcycle came up right next to me as we waited for the lights to change. I politely said I have a right to a single lane. The motorcyclist said, “in CA, small vehicles like bikes and motorcycles can share a single lane.” I brushed it off thinking he was ignorant, but when I got home, he was right. In CA, it is perfectly legal to lane share and lane split. It’s not just about cars vs bicycles anymore. With high gas prices, it’s becoming cars vs motorcycles vs bicycles. Right on. We face similar issues here in the Chicago area, although I’m proud to say we have a very good Bicycling Council in our small town (Batavia, IL, pop. 25,000). We are tackling those subjects one at a time, working on signage, road stiping (sharrows, etc,) and better year-round use or an excellent mostly-paved local trails network. Unfortunately, the trail network doesn’t go everywhere, which leads us to a situation where we have to explain to non-cyclist drivers and residents exactly why they’re seeing a bike actually ON THE ROAD when there’s a great trail very nearby. Baby steps. I agree that we should share the roads with cyclists who ride bikes for means of transportation; but I don’t understand those people who take advantage of this and think that the roads/streets are their personal gym. It is dangerous for the drivers because we cannot reasonably guess how fast they are moving; they often ride in groups, anywhere from 2 to 50 on weekends; I live in Irvine, where most streets have bike lanes, but these lanes are for people who use bikes for transportation, not for your personal fitness. We drivers don’t (and shouldn’t) use the public streets/roads for our personal race tracks, how come there’s no speed limit or any kind of vehicle codes enforced on these cyclists? Bike lanes, as well as other traffic controls in the state of California, are established for the safety and benefit of anyone and everyone lawfully using the public roadway, regardless of the type of vehicle or the purpose of the trip. Neither the Vehicle Code nor the Streets & Highways Code makes any distinction between utilitarian and recreational use. Many driving trips are recreational; should they be banned as well? Bicyclists are generally subject to the same rules in the state Vehicle Code as drivers of cars. They can and do get cited for violations from time to time, though many law enforcement agencies don’t put a high priority on this. The speed limit for a bicyclist is the same as the speed limit that’s posted on the white sign at the side of the roadway. Why should it be any different? You are responsible for maneuvering your vehicle safely when passing, turning, changing lanes, etc. If, while preparing to make any of these movements, you have trouble judging a bicyclist’s speed, I have the following advice for you: err on the side of caution. Reduce your own speed and (depending on the situation) yield to them. You probably won’t end up being delayed very long — seconds at most. So let me get this straight, Jean. Cyclists riding their 20 lb. bicycles are making it dangerous for you in your 3,000 lb. vehicle? I think you’ve got that a bit backwards. And if you have trouble sharing the streets of Irvine with cyclists, when that city has some of the widest traffic lanes and more marked bike lanes than any other city in the area, you should just turn in your car keys and driver’s license now before you hurt someone. Your comments about bike lanes being only for transportation purposes are providing some good entertainment for me and my friends. Don’t freak out, but I’m going for a recreational ride on public streets this afternoon. Jean, by your logic, anyone driving a car for the purpose of transporting oneself to any form of recreation would be using the roads for an illegitimate purpose. Same for — egad! — driving to the gym. Stop using our roads for your personal workout! Try riding a bike, then you can skip the gym.